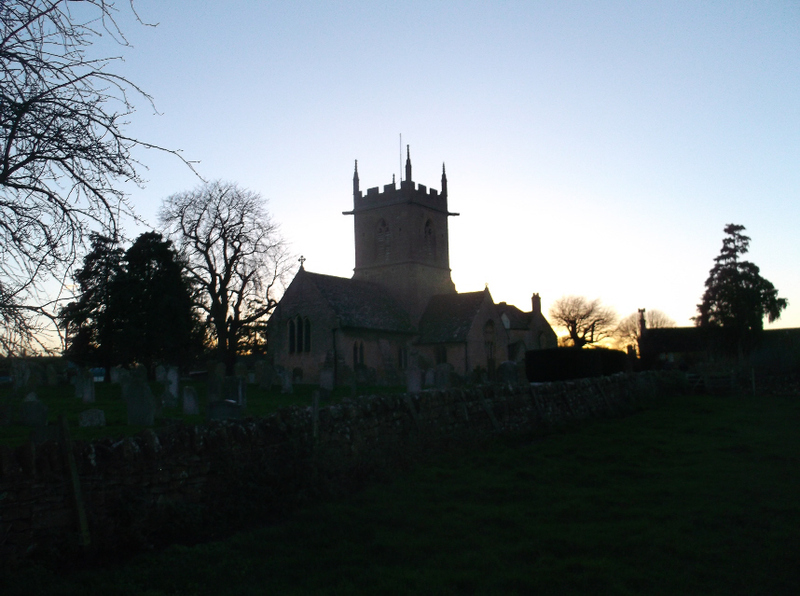 St Peter's Church, Willersey Village as the sun sets. 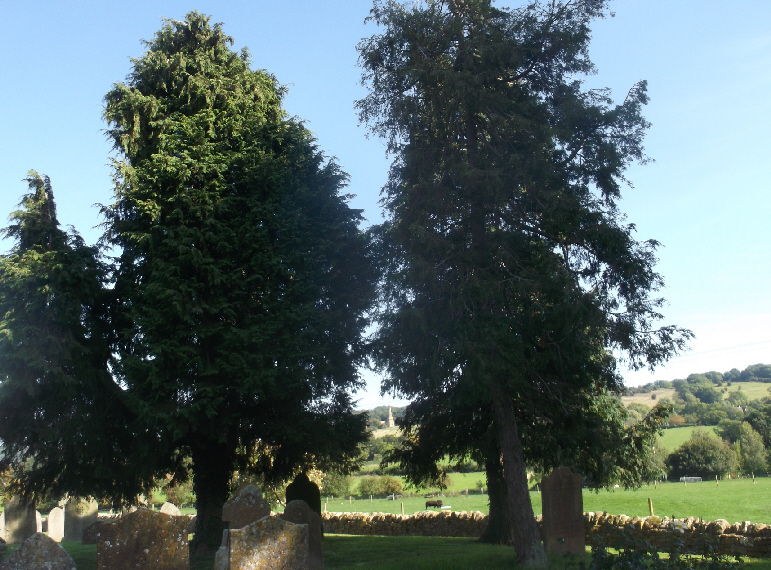 Our parish Church is beautifully positioned at the end of Church Lane and is surrounded by a traditional churchyard. St Peter's has a fifteenth century bell tower with traditional pinnacles and gargoyles. The little north porch is thirteenth century. The filled up Norman door can be seen on the west side of the Church. The font is pure Norman and the internal pillars and arches are 13th century. 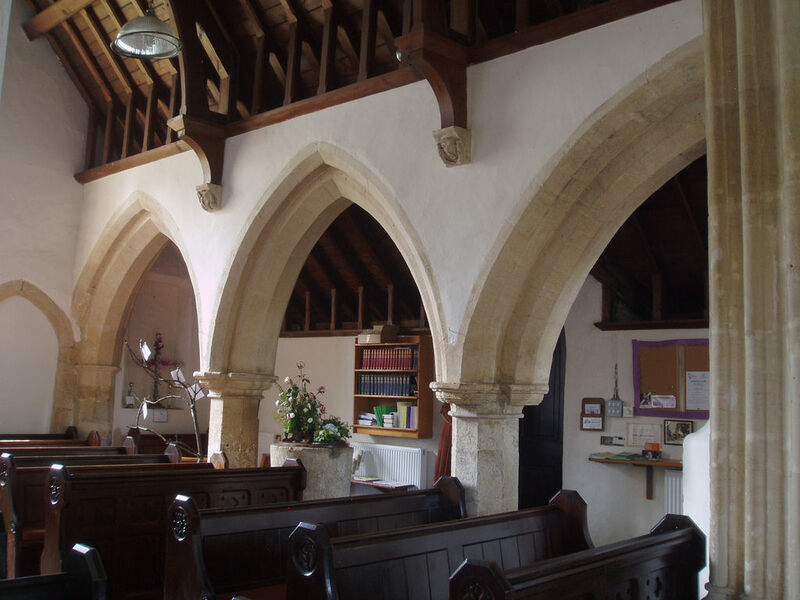 These arches are quite remarkable for a village Church. Every Wednesday at 11:00am we celebrate Holy Communion with the traditional language from the 1662 prayer book. You are always very welcome at our Church. We hope that the love of God will touch your heart during our services. Do come along and/or drop in for a coffee and a chat from 11:30 to 12:00 noon. There is a car park at the rear of St Peter's Church, with access from Church Street alongside the Church, opened in January 2018 with generous support from a local charity. It is for the use of those attending services or functions at the Church and will provide a much needed and long awaited, facility. It will always be open for those visiting the Church for any reason, but not for overnight parking. It will prove to be especially useful when larger numbers of people attend the Church for eg: funerals, weddings, Christmas, Easter, Harvest Festival, and Remembrance Sunday etc. It will prevent congestion in Church Street. 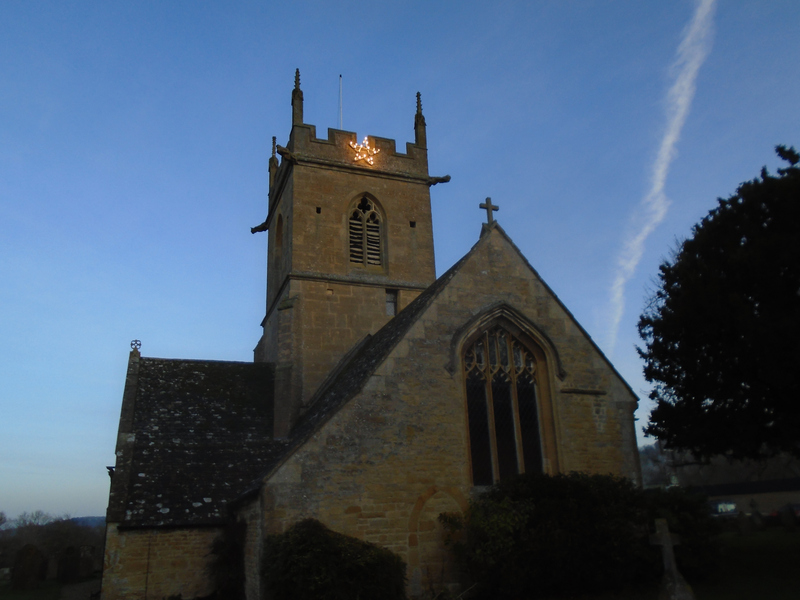 Every edition of our Church and Village News contains a message from our rector. St Peter's in Willersey, St Lawrence with St John the Baptist in Weston-sub-Edge, St Andrew's in Aston Sub-Edge, St Lawrence in Mickleton, St Ecgwin's in Honeybourne, St Peter's in Pebworth, St Peter's in Dorsington and St.Nicholas' Church in Saintbury are all part of the Vale and Cotswold Edge benefice. 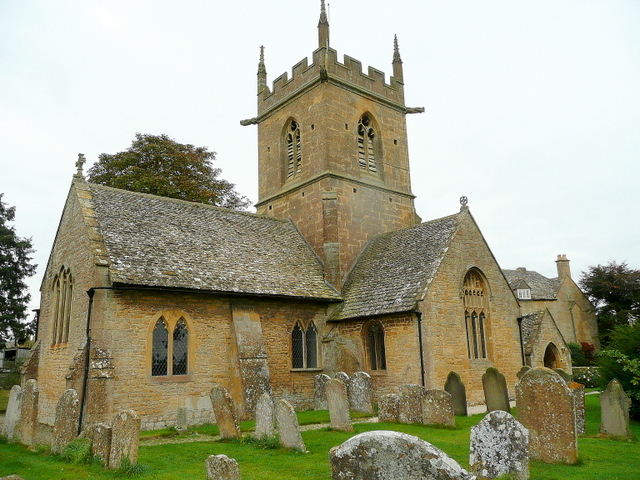 The United Benefice of Chipping Campden, Ebrington and Mickleton is also under the care of the Rev'd Craig Bishop. For more details about our services look on pages 10 and 11 of the appropiate Church and Village Newsletter. Below are the times of all our local Benefice Services for April 2019. Below are the times of all our local Benefice Services for Holy Week 2019. Below are the times of all our local Benefice Services for May 2019. Below are the times of all our local Benefice Services for June 2019. Here is our Easter Card for Easter 2019. Please note that the date for Good Friday in the printed version was incorrect. Its corrected here. Here is a 2018 Christmas message from Bishop Rachael. According to a YouGov poll, the most popular New Year's resolutions for 2018 were: To eat healthier; to get more exercise; to save more money. What resolutions, if any, have you made for 2019, I wonder? I suspect that the ones I've just mentioned will be familiar to many of us. Depending on when you read this, you may be in the process of making your New Year's resolutions. Or, you might be marking with satisfaction that, a few days into 2019, you've so far been successful in doing, or not doing, what you resolved to. Or, of course, you might be lamenting that resolutions made with such sincere intent have already gone by the wayside. If that's you, be kind to yourself! At the time of writing this, we've gone through a turbulent week in British politics – a reminder that, as we stand at the threshold of 2019, many of us will have very little, if any, idea of what's in store for us in the year to come. Perhaps the only thing that we can be certain of is uncertainty and living in a world of uncertainty can, to say the least, be difficult. It often makes us feel lonely and afraid. Our unrealistic expectation is that politicians will somehow make it all better. That won't do, though, because it absolves us of the responsibility that we all have to make the world a better place. Whilst there's nothing wrong at all with the resolutions that I've cited from last year’s YouGov poll, they are all about us and I'd like to suggest a different and, dare I say, a better, kind of New Year's resolution, one in which we, together, resolve to make better the places where we live, work, learn and play. At Christmas time the tower of St Peter's is lit by a star. Here is our Benefice Christmas card for 2018. St Peter's has a famous peal of six bells which are rung regularly. It is a Grade I listed Church and is therefore judged to be of exceptional interest and the highest architectural merit. ( C12th nave with blocked South doorway. C13th North porch. North aisle rebuilt in the C13th. C15th tower. C19th vestry and restoration. The ancient font, supposed to date from the 13th century, is preserved, though not now in use. There are some remains of 13th or 14th century stained glass: the church affords 250 sittings. In 1897, the living was a rectory, yearly value £275, with residence, in the gift of E. Gibbon esq. of Gateacre, Liverpool, and held since 1891 by the Rev. Charles Oldfeld Bartlett MA. of Exeter College, Oxford. There is a charge by will, of £8, on a farm here, paid annually to descendants of the Pendrell family, who harboured Charles II in 1651 when a fugitive. 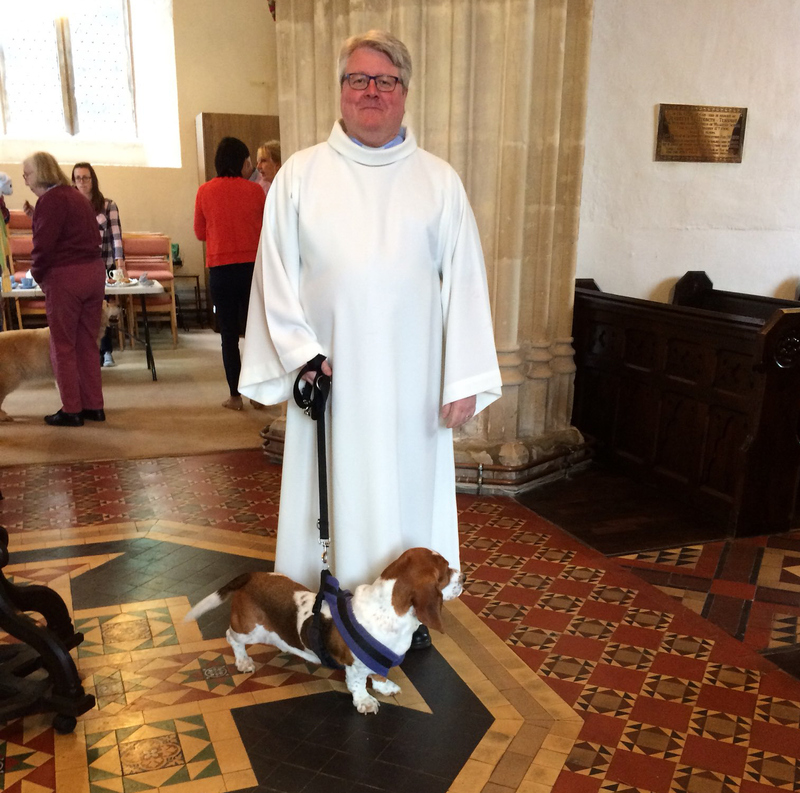 The Rev Scott Watts and his dog Marigold at the recent Pet Service in June 2018 in Willersey. 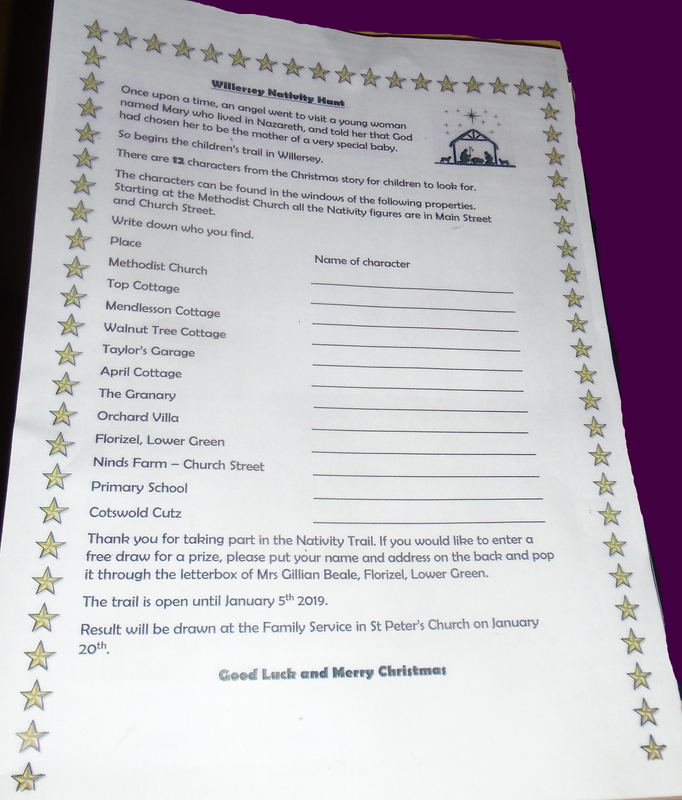 You and your children can follow St Peter's Nativity Trail around Willersey. Click on the form below to see a larger version and maybe print it. You can also find copies in the Church Porch, Willersey Stores or at Florizel, the last house on Main Street by the mini roundabout. Enjoy. If these dates are not convenient, as before please could you make your own arrangements to swap duties. A course being run on behalf of the Vale and Cotswold Edge Teams at the Thatched Tavern pub at Honeybourne, started on Monday 9th April 2018 at 7.00 till 8.30pm. It lasted 8 weeks. All are welcome to attend and join us in a relaxed atmosphere as we talk over a beer about some of the questions many people have. You can of course just say nothing if you'd prefer! It's a simple format with short videos, no singing or praying, cynic friendly cringe free but totally relevant. No bible, Christianity or church knowledge needed. No need to book, just turn up. Please call Rev Scott Watts on 01386 834946 for more information. Scott would also be delighted to meet you separately to discuss any issues or particular questions. We looked forward to seeing you on 9th April 2018. I approach the New Year with a mixture of excitement, anticipation and with a bit of nervousness! I look forward it. I love looking at my new diary, not yet full with commitments, and wondering what events will fill its pages. Some will be happy, things to really look forward to, and some, of course, will be sad. “For surely I know the plans I have for you, says the Lord, plans for your welfare and not for harm, to give you a future with hope. Then when you call upon me and come and pray to me, I will hear you. When you search for me, you will find me; if you seek me with all your heart…” Jeremiah 29: 11-13 (NRSV) and those words fill me with hope. God is Sovereign and whatever the year ahead has in store for us, we can be absolutely confident that God will be with us. This is good news for us as individuals and for our villages and communities. 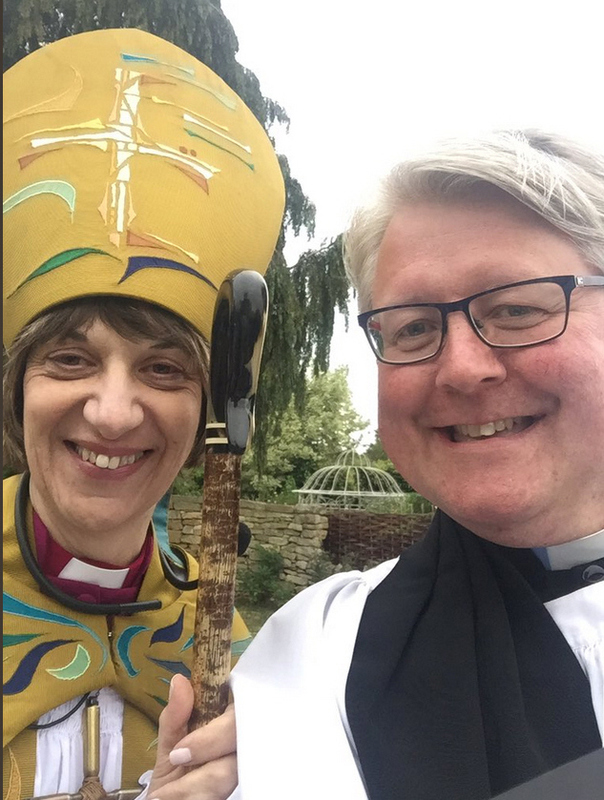 Over the last six months that I've been with you as your Vicar, I have a growing sense that God has good and positive plans for our churches and communities. There is something for us to do, though, and Jeremiah sets it out clearly. We are to be a people who pray and who seek God and His will. And what happens when we do those things? In Jeremiah’s words, God will hear us and we will find Him if we seek Him with all our hearts. What wonderful words. Even when we walk into the darkness of uncertainty, we do not walk alone. God is with us – that Good News is at the heart of the message of Christmas, the coming of our Saviour, Jesus Christ, so recently celebrated and so fresh in our minds. So, I encourage you in the year the lies ahead to ‘put your hand in the Hand of God’ and, if I can help and support you in anyway, regardless of whether or not you come to church, please let me know. There is a list of Rectors on display in our Church. The list is taken mostly from the Hockaday Abstracts (in Gloucester) and the Bishops' Certificates of Institution (Public Records Office). There are periodic gaps in the list (eg between 1444 and 1553). The first ten listed Rectors apparently all served within the space of two decades! What could the explanation be? Perhaps, that they were actually a succession of religious (monks) visiting to put in periods of service from Evesham Abbey? This list does give you some sense of the antiquity of St Peter's. Notice also that historically spelling was inconsistent - hence the many spelling variations of Willersey. Saintbury Church is visible from St Peter's Churchyard. Here is the order of service for the licensing of Rev Scott Watts, our new vicar in June 2017. The Bishop of Gloucester came to Willersey to lead the licensing of the Rev'd Scott Watts. Here is our Easter Card for Easter 2018. This is a copy of our Easter Card which gave details of our 2017 Easter Services. This is a copy of our Easter Card which gave details of our 2016 Easter Services. This is a copy of our Christmas card which gave more details of our 2016 Christmas Services. 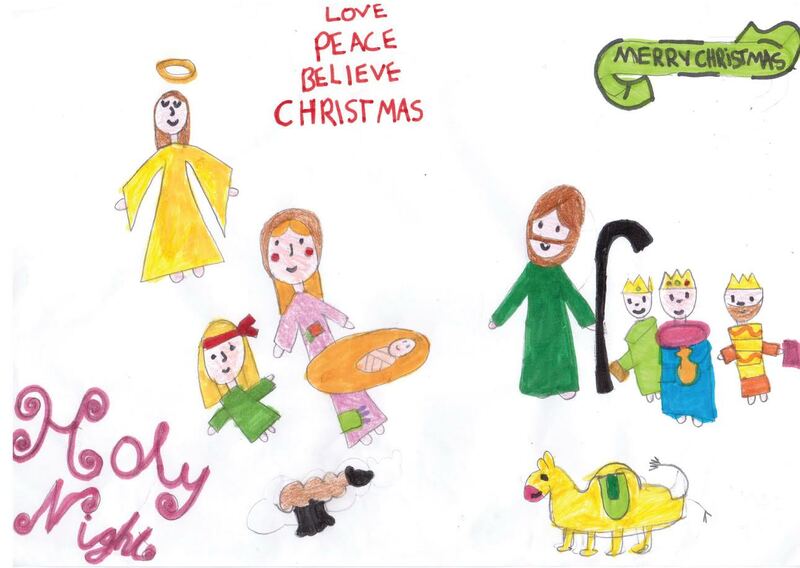 Here are two paintings done by Willersey school children for our 2016 Christmas card. Front of our Christmas card and the back. We have policies for safeguarding children, young people and vulnerable people. February (2017) to me is the time when we can begin to put winter behind us and look forward to spring, and new life in the shape of our gardens and fields being filled with new growth and baby animals of all sorts appearing in the countryside. Life means all sorts of things to different people. What ‘floats your boat’, ‘gets you going’ andd ‘energises you’ are some of the expressions we use to describe the things which really interest and animate us. 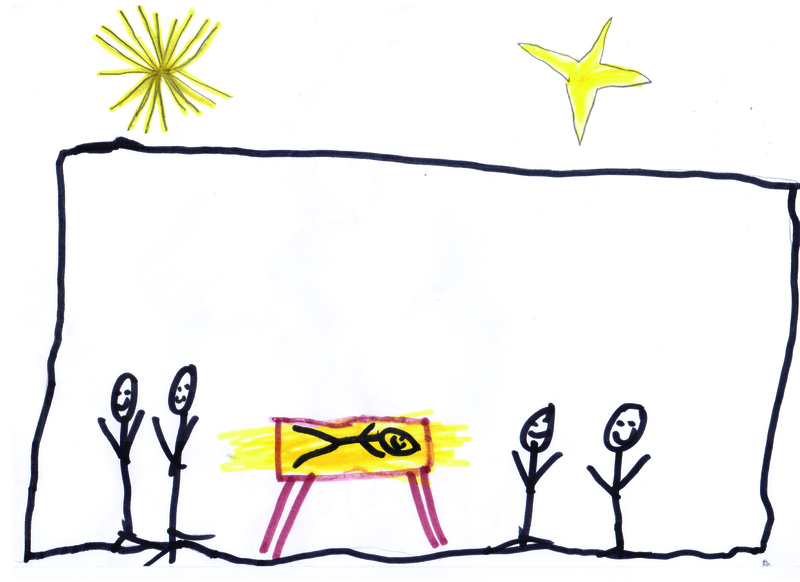 The Diocese of Gloucester launched its new vision at the beginning of Advent, and it too is called LIFE. LIFE stands for Leadership, Imagination, Faith and Engagement. In the next five years your church communities are being challenged to find new ways of engaging with everyone in the communities in which we live and work and socialise. Do look out for events and activities which will be happening in your local parish church. And you are always welcome to join us at a service or just for a chat. The inspiration for the name of the vision document comes from a saying of Jesus: “I have come that they may have life, and have it to the full”. (John 10:10). More details of our plans can be found on the diocesan website, if you wish to take a look! As Winter turns to Spring, may your life be energised through new growth, so that your hopes and dreams will be fulfilled. Past Assistant Curate. Vale and Cotswold Edge Team Ministry. Here is a copy of the Benefice Christmas card for December 2017. Two hundred solar panels are being fitted to the south nave roof of Gloucester Catherdral from September 2016 onwards at part of a £6 million overhaul of the 15th century building. This should cut its carbon footprint and save 25 per cent on its energy bills. This is part of Project Pilgrim. Divisions on ways to modernise an ageing church will trouble the new synod. (Harriet Sherwood, Religion Correspondent, The Guardian, 22nd November 2015). Discord over a radical programme to make the Church of England “fit for purpose” in the 21st century is set to spill into the open this week when the new synod meets at the start of its five-year term. The Reform and Renewal programme was initiated by the archbishop of Canterbury, Justin Welby, and is being enthusiastically driven forward by a cohort of senior figures who share his zeal for modernising and evangelising the church. However, critics fear that traditional values could be lost amid the speed of change, lack of consultation and a new culture of setting goals and targets. “Some of those driving the Reform and Renewal agenda don’t seem to understand the complex nature of the institution they are seeking to improve. In trying to change the church, there is a significant risk of unintentional vandalism,” said Martyn Percy, dean of Christ Church, Oxford. Another key area is recruitment and training. Around 40% of the church's clergy will retire in the next decade, yet fewer people are putting themselves forward for ordination. The church needs to attract recruits, especially those described by Spence as “game changers”, and provide accelerated career paths and appropriate training. The selection of a “talent pool” – clergy to be fast-tracked to leadership positions – has caused consternation among those accustomed to a system of quiet recommendations for preferment. Their unease has been compounded by bishops and deans being enrolled on MBA-style management courses. But, he insisted, “money and business is not the model. We're still meant to be the church of Jesus Christ, but we just need to be more hard-headed and pragmatic about it.” We're in the last-chance saloon. Unless we do something in the next five or 10 years, we're shot. Some have expressed anxiety over talk of efficiency, success, targets and data. According to Percy, there are real concerns about “the uncritical use of business principles, which are mostly untested in the church and may not be the most appropriate fit”. Under Welby's leadership, he said, the church was being run by people with an “executive managerial mindset”. Welby is a former oil executive and many in his inner circle have business or banking backgrounds. Linda Woodhead, professor of the sociology of religion at Lancaster University, shared the view that Reform and Renewal “true believers” were not sufficiently reflective. Evangelism with a business-model spin was not the solution. “Rather than stepping back and asking, ‘why are we going down this path [of decline]’, they think, ‘let's preach the message louder, let's keep being more prophetic, and that will somehow attract people’,” she said. A letter from our last vicar. We are now safely installed in the vicarage in Addington and have just reached the point of deciding where to put pictures on the walls, so before any more time elapses I wanted to write to say thank you. Firstly thank you to the many of you who came to my last service in Honeybourne. It was a wonderful experience to see the church so full of friends, there firstly to worship God and secondly to wish us God speed. Thank you too to the many who could not be there but who sent cards to wish us well. It was good to be able to spend time eating together after the service in Weston sub Edge so thank you to those who made that possible – I know that these things don’t happen on their own! Worshipping together and eating together, what better way could there be to celebrate our common life in Christ and the journey we have made together? Which brings me to our beautiful gifts: I grew up in Gloucestershire so its countryside is special to me and holds many precious memories of childhood, of parents, of people who have been saints along my journey so it is wonderful to have a book which captures so delightfully the essence of its landscape and life and combined with poetry, another of my loves, could not have been more aptly chosen. One of the things that we have enjoyed learning while being in Honeybourne, has been gardening. We are still amateurs, but have come to appreciate time spent wondering at the beauty of plants, at their determination to flourish and time spent with the soil as a way of getting life in perspective. Here in Addington we have a big garden. It is a good time of year to move because we shall discover over the next few months what is in the garden. Edward's book on Making a Garden will be an invaluable resource as we move through the seasons and as he discovers the joys of retirement. I said at the beginning of this letter that we are in the process of deciding where pictures are to go. We are very much looking forward to deciding on a place for the two wonderful paintings of Gloucester Cathedral, the Cathedral that has played such an important part in our lives. For me that goes back a long way to picnics as a child with my Nan and Mum in the Cathedral precincts, to playing in the Youth Orchestra there and finally, after a gap of many years, being ordained there in 2008 when it became a part of Edward’s life too. I love the Cathedral at night which speaks of the unfailing caring presence of mother church and Edward’s, ”The organ plays” says all that can be said about the way in which music transcends bricks and mortar and any possible boundary we might attempt to put in place. The picture of the churches in the group will likewise find a special place and be a reminder of the gift that being among you was. Thank you too for the very generous cheque which accompanied these lovely gifts. We shall spend it wisely. So now, another chapter in our walk with God is beginning for both you and for us. I keep you daily in my prayers as you enter a period of discernment. For us we are in that strange place of belonging but not belonging before my Institution on the 28th April. Last Sunday we worshipped at Southwark Cathedral and we have yet to decide where we shall worship tomorrow. Although it feels rootless it is good to have time to reflect and to pray and I am grateful for these in between days. May God bless you as you journey together. Christmas is upon us once again and we are caught up in a whirl of buying and parties and Carol Services. Yet, as I reflect upon the noise and bustle of the season, it occurs to me that at the centre of all this activity is great stillness. 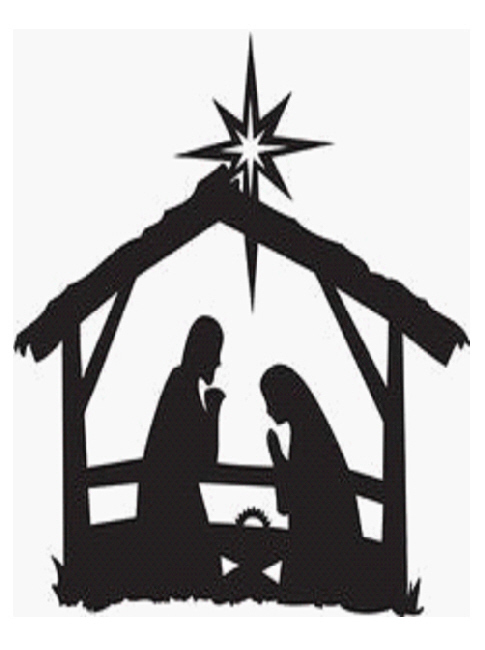 God’s outpouring of self to become human in the babe in the manger is not a noisy affair. The Father looks on the Son with a steady gaze as time stands still and the author of all that is, lies helpless, a still point in his creation. As the carol puts it, “how silently, how silently the wondrous gift is given.” So as we wrap the presents and do that last minute shopping, as we deck the halls and our houses fill up with guests, let’s pause for a moment and reflect on the stillness of the manger scene. It is from this place of wonder and stillness that true celebration comes. If we can but pause and gaze then the gradual dawning of all that that quiet scene means for the world will give our joyful celebrations an added exuberance. I love Christmas, I love giving presents, I love the faces of children caught up in the wonder of it all, I love the spirit of goodwill that comes as a welcome guest for a brief spell, but most of all, I love the quiet simplicity of the child in the lowly manger. May I, Celia and the churchwardens wish you all a joyful, exuberant and peace filled Christmas. An Easter Card and Message for 2015 from the Reverend Debbie Forman. We have journeyed together through Lent, exploring puzzling questions, but the last week of Jesus' life takes us on a different sort of journey. We begin the week hopefully as we enter Jerusalem with Jesus and we join with the crowds acclaiming him King. But all too soon the storm clouds gather as Passover approaches. The disciples gathered for that meal know it will be the last. They claim they will be faithful. Like the disciples we gather in the upper room professing our faithfulness, yet we, like them, shall all abandon him. In the garden we fall asleep and fail to watch and wait. Mingled with the crowd we forget our shouts of “Hosanna“ and bay for his blood “Crucify him!“. He hangs on the cross and we weep. His body is laid in the tomb and our hearts are empty. Is there really nothing….? And just as we are tempted to give up, the light of the Resurrection shines through the darkness and hope and joy explode in our hearts. He is risen. Yes, he really is! A blessed and exuberantly joyful Easter to you all. the footwashing and the watch until midnight. You can download a copy of this card and message.